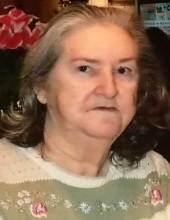 Mary Burross, age 71, of Madisonville, Texas, passed away Saturday, November 24, 2018 in Bryan, Texas. A graveside service has been scheduled for 11 A.M., Thursday, November 29, 2018 at Dodge Cemetery in Dodge, Texas. There will be no public visitation. Mary Frances Burross was born May 24, 1947 in Huntsville, Texas to Marcus Odell & Mildred (Bailey) Burross. She was raised in Huntsville and worked in the dry cleaning business. She was also a caregiver to the elderly. Mary had lived in Dallas and Bryan but had spent the last five years in Madisonville. She enjoyed arts and crafts and loved cats. Mary was preceded in death by both of her parents and brother, Marvin Burross. She is survived by sister, Jo Ann Adams (Thomas) of Madisonville; nieces, Beverly Newton (Jay) of Lake Limestone and Patty Walther (Greg) of Madisonville; cousin, Danny Coker of Huntsville and great nieces and nephews, Nicole Warren of Madisonville, Callie Walther of North Zulch, Josh Newton of Madisonville and Carl Walther of Madisonville. Mary is also survived by several great, great nieces and nephews. To send flowers or a remembrance gift to the family of Mary Frances Burross, please visit our Tribute Store. "Email Address" would like to share the life celebration of Mary Frances Burross. Click on the "link" to go to share a favorite memory or leave a condolence message for the family.